A series about Danish politics sounds like the world's worst elevator pitch, yet Borgen turns out to be really, really good television. 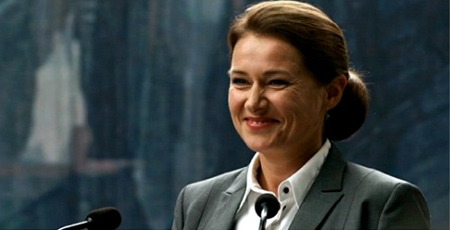 A large part of its appeal is Sidse Babett Knudsen, a prodigiously skilled and charismatic Danish actress, who plays the country's first female prime minister. The tightly-written show focuses on the aspirations and shenanigans of coalition politicians, the effects on their personal lives, their staff, their families and on the reporters who cover it all. One of our favorite things about the show is its lack of bombast—much of its power comes from its elisions and silences, the shadows that hang over two people having a cup of coffee. So far, it's not available from the usual suspects (Netflix, Hulu, etc. )—DVD is the only (legal) way to go. Cabinet maker Fritz Hansen, 22 Wooster [Grand/Canal] 212.219.3226, established his eponymous business in 1872. The company now sells top classic Danish furniture designers, including Arne Jacobsen, Hans J. Wegner and Piet Hein… More options at the Danish Design Store. Danish Paintings from the Golden Age to the Modern Breakthrough, a selection from the collection of Ambassador John L. Loeb, Jr., are on view at Scandinavia House through January 25. At Munch Gallery, 245 Broome [Ludlow] 212.228.1600, Paper is a group show of 20 Danish artists working in black and white on paper. Mads Refslund made his name as co-founder of Noma. His New York venture, Acme, 9 Great Jones [Bway/Laf] 212.203.2121, is American on paper, Nordic at heart, full of delight. At Luksus, 615 Manhattan Ave. [Nassau] 718.389.6034, in back of Tørst, Daniel Burns (Noma, Momofuku) isn't cooking Danish, but it is Danish-ish and has earned the adulation from foodies—despite its $95 prix fixe (in Greenpoint!). A genuine taste of the country comes courtesy of the open-faced sandwiches of Aamanns-Copehnhagen, 13 Laight [6th/Varick] 212.925.1313. Monocle makes the case for Copenhagen as the world's most liveable city and the World Happiness Report 2013 names Denmark #1. You Disappear, by Christian Jungersen, is the story of a Danish woman trying to cope with the altered personality of her husband, diagnosed with a brain tumor. A suspenseful, unsettling read. Jussi Adler-Olsen is probably the Danish writer best-known stateside and he's a top-seller in his home country for absorbing murder mysteries about "Department Q" and its only detective. Start with The Keeper of Lost Causes. Sara Blaedel is one of Denmark's most popular novelists—her crime fiction series features Copenhagen Murder Squad detective Louise Rick. The first in the series isn't published in English, so start with number two: Call Me Princess. Danish singer-songwriter Karen Marie Ørsted, known as Mø, is a rising electro-pop star. Bikini Daze is her EP; a full album, No Mythologies to Follow, is out next month. Over at the NY Phil, Alan Gilbert celebrates the work of Carl Nielsen with recordings over the next few years of the composer's work. First out is Symphonies 2 & 3. The Danish Seamen's Church, in Brooklyn Heights, is a place of worship and also a community and cultural center. Bjarke Ingels, Denmark's starchitect, has designed what looks to be a stunning residential building for West 57th Street at the Hudson and will be designing another residential project on East 125th.